We are thrilled to share our 2016 Annual Report with you. It highlights how we accomplished our mission this past year and the significant outcomes our programs and services have had on the 2,088 youth we served. Every minute, every day YOUR donations are actively working to reduce challenges that our local kids face such as food insecurity, obesity, violence and summer learning loss. Your support gives them hope and a consistent safe place to rely on. 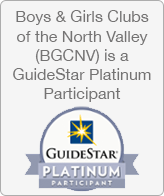 Because of you, the Boys & Girls Clubs of the North Valley is able to continue to save and change local kids’ lives – THANK YOU!